In 2014, grain and silage performance trials were planted at 14 locations in four production zones: the southern, south central, north central, and northern zones. Both seed companies and university researchers submitted hybrids. Companies with hybrids included in the 2014 trials are listed in Table 1. Specific hybrids and where they were tested are shown in Table 2. A summary of the transgenic traits tested in 2014 is shown in Table 3. In the back of the report, hybrids previously tested over the past three years are listed in Table 24. At most locations, trials were divided into early and late maturity trials based on the hybrid relative maturities provided by the companies. The specific relative maturities separating early and late trials are listed in the tables. Seasonal precipitation and temperature at the trial sites are shown in Table 5. The 2014 planting season, like the 2013 season, was one of the longest ever recorded in Wisconsin. 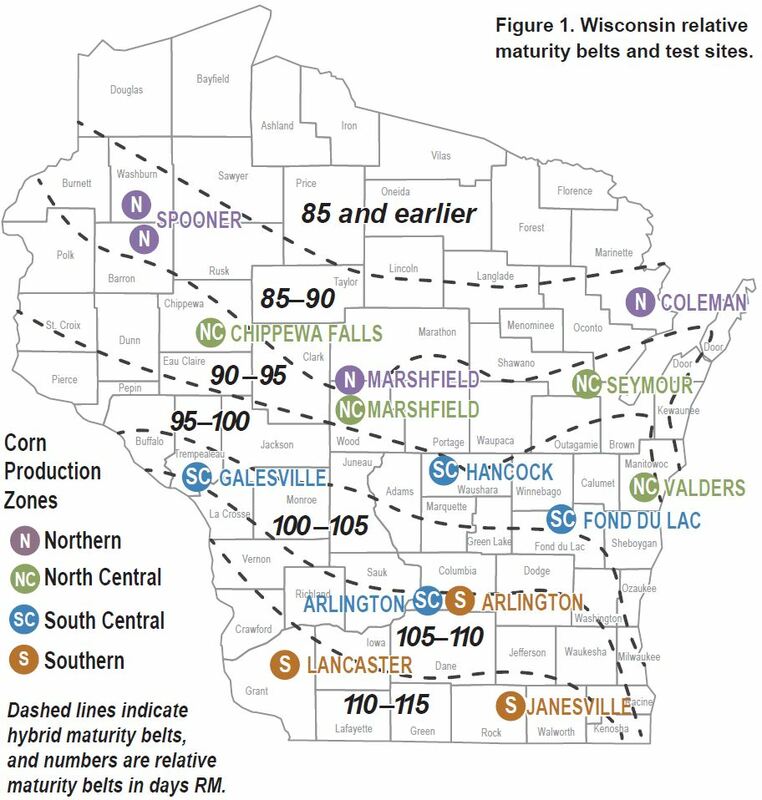 Frequent rains caused delays, with many growers in north eastern Wisconsin not planting until mid-June. Delayed planting at Coleman, Marshfield, Seymour, and Valders combined with a cool growing season delayed harvest producing grain that was higher in moisture and lower for test weight than average. Over the entire growing season, growing degree-day accumulation was below the 30-year normal in both northern and southern Wisconsin. During May and June precipitation was significantly above average throughout Wisconsin. Cold weather and snow occurred during early November affecting grain dry down at Coleman, Marshfield, and Seymour. Little insect or disease pressure was observed in the trials. Grain and silage yields were above normal compared to the 10-year average at early planted sites. Yield results for individual location trials and for multi-location averages are listed in Tables 7 through 22. Within each trial, hybrids are ranked by moisture, averaged over all trials conducted in that zone during 2014. Yield data for both 2013 and 2014 are provided if the hybrid was entered previously in the 2013 trials. Starting in 2009, a nearest neighbor analysis of variance for all trials as described by Yang et al. (2004, Crop Science 44:49-55) and Smith and Casler (2004, Crop Science 44:56-62) is calculated. 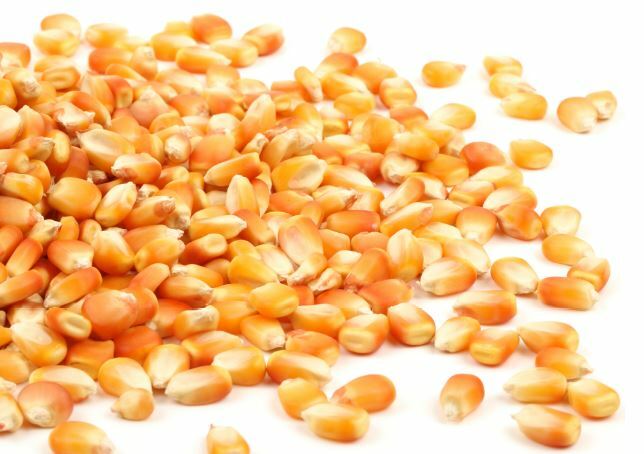 A hybrid index (Table 2) lists relative maturity ratings, specialty traits, seed treatments and production zones tested for each hybrid. Make a list of 5 to 10 hybrids with highest 2014 Performance Index within each maturity group within a trial. Scan 2013 results. Be wary of any hybrids on your list that had a 2013 Performance Index of 100 or lower. Choose two or three of the remaining hybrids that have relatively high Performance Indexes for both 2013 and 2014. Be wary of any hybrids with a Performance Index of 100 or lower for 2013 or 2014 in any other zones. Remember that you don't know what weather conditions (rainfall, temperature) will be like next year. Therefore, the most reliable way to choose hybrids with greatest chance to perform best next year on your farm is to consider performance in 2013 and 2014 over a wide range of locations and climatic conditions. You are taking a tremendous gamble if you make hybrid selection decisions based on 2014 yield comparisons in only one or two local test plots. Copyright © 2014 by the Board of Regents of the University of Wisconsin System doing business as the division of Cooperative Extension of the University of Wisconsin-Extension. All rights reserved. Send copyright inquiries to: Cooperative Extension Publishing, 432 N. Lake St., Rm. 227, Madison, WI 53706, pubs@uwex.edu.